The mechanism behind your garage door is simple enough that its individual functions are easily understood - but they're also complicated enough that most residential garage door service and maintenance needs are better provided by professionals. With this said, there are still many things that you as the homeowner can do to make sure that your door and opener are functioning as well as they should. Go through this maintenance checklist periodically to nip any malfunction in the bud. Because the entire operation of the door and opener relies on their mechanisms moving in perfect coordination, it is crucial to keep every component clean and free of any obstructive material. Some of the most common parts where grime and dirt build up are the tracks. You need to periodically get in there to remove all of the nasty build up that's clogging up the tracks and preventing smooth travel of the rollers. Another very important part to keep clean is the photosensors. These photo eyes are essential for safety and security purposes. When they're dirty, it would be like they were tripped and you'll experience a malfunction where the doors won't go down because it assumes that there is someone under the door. So prepare your cleaning rags, vacuums and brushes and keep those door parts clean. 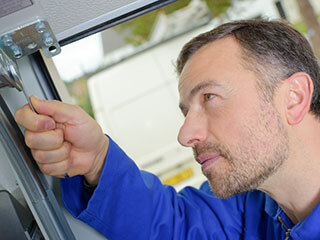 The need for garage door maintenance may often be overlooked simply because we don't inspect our doors often enough. First look at the tracks and rollers. These two parts in conjunction provide the means for the doors to travel up and down. If they're dirty, or if they're rusted through, the door may get stuck or it may shake as it opens or closes. If it is bent, then you might need a garage door adjustment to fix the alignment. Springs are also important to the opening and closing function of the door. It is after all the springs that provide the necessary force to carry the weight of the door. Your garage is either utilizing a torsion or an extension spring setup. If during your inspection you discover that your springs are broken, or are about to break, then you need to call in the professionals for a broken spring replacement. The next set of components that need to be checked are the bolts. The bolts are sometimes neglected since they are essentially in the background. They are not performing a dynamic action that's involved in the opening or closing of the door. However, when these bolts are loose or missing, the entire door mechanism may break apart. You need to check the bolts if they are present or if they are nice and tight. The hinges on the door are also some of the components that are easily overlooked. Hinges function well if they are lubricated, so lubricate them often and always be vigilant of encroaching rust. Cables work together with the springs to safely lift the door open or to lower it to close. When they snap, the entire door could come crashing down. To maintain safety in your garage, you need to check for frays. These indicate that the cable is about to give and if they're present, it may just be time to call the professionals for some garage door repair parts. Testing your door balance is the one test that you can do to determine if your cables and springs are working well. You'll need to do this every now and then to make sure that your opener isn't bearing more of the weight of the door than it is supposed to. Having a perfectly balanced door will protect your operator from unwanted stresses and this, in turn, means that you won't have to contact our garage door service provider for repairs for something that could've easily been avoided.